I love challenges — especially food challenges — and I love to great creative with food. Recently, I was given the opportunity to create a dessert recipe inspired by one of the new Renuzit Tempting Indulgences air freshener cones. Not your typical challenge, right? But that’s why I like it! I was sent two of the new Renuzit cones to smell and get inspired by: Crème Brûlée and Chocolate Covered Cherries. I got busy planning. I decided ice cream sandwiches were a must for this challenge because I had recently bought an ice cream sandwich maker on clearance at Walmart and I was dying to use it. 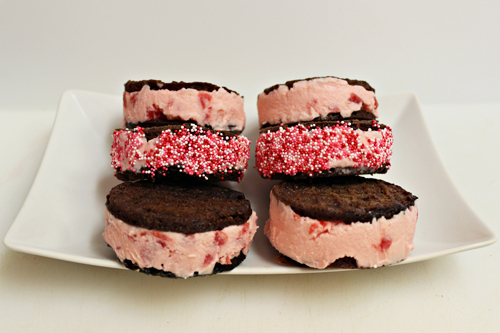 I decided I would do a cherry ice cream and “cover” it with chocolate cookies to make my sandwiches. NOTE: You don’t need the Ice Cream Sandwich Maker to make this recipe — you can use any chocolate cookie recipe of your choice. The Chocolate Covered Cherries scent was a perfect match for my sandwiches! 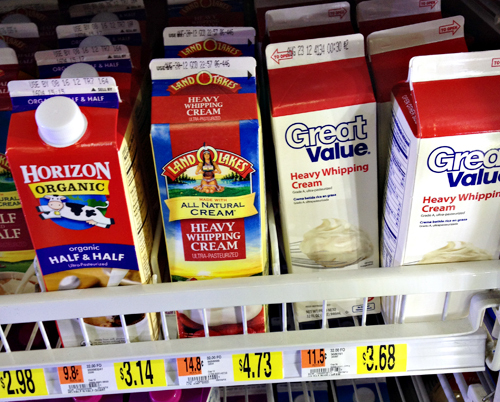 I headed to Walmart to pick up ingredients to make a homemade Maraschino Cherry Ice Cream. 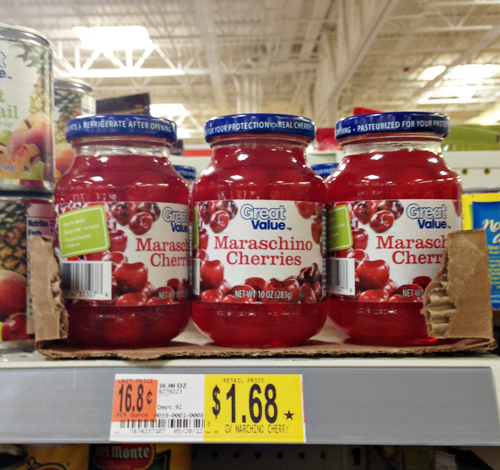 One of the main ingredients (obviously) are maraschino cherries…. …and whipping cream. I took a lot more photos during my shopping trip — you can see a slideshow of them here. 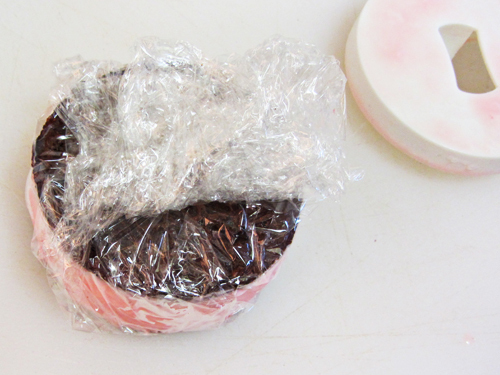 The first step is to get your ice cream base ready. 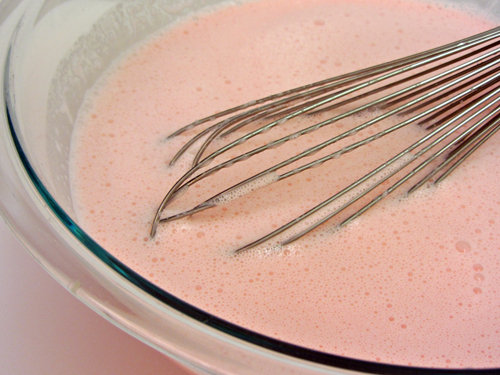 It’s a mixture of whole milk, sugar, whipping cream, vanilla extract, and the maraschino cherry juice (from the jar). Mix all this up and put it in the refrigerator to chill. 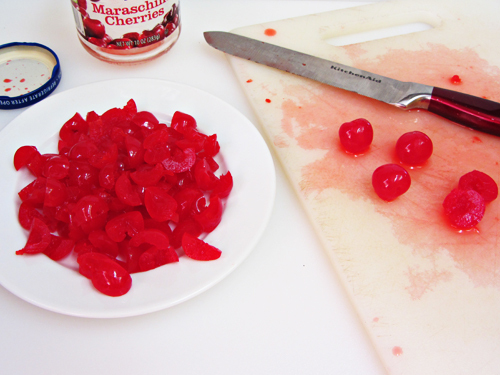 While the ice cream base hangs out in the refrigerator, you’ll cut up your cherries into fourths. 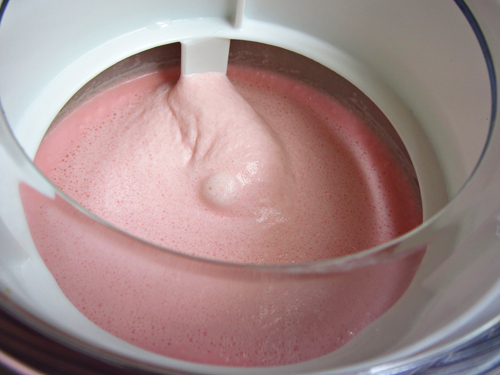 Following the directions of your ice cream maker, place the ice cream base into your maker. Don’t add the cherries yet! You will add your cherries when the mixture is thickened — about 5-10 minutes before it’s done. 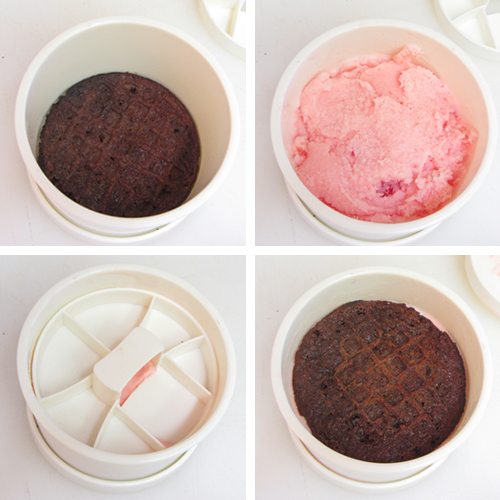 While your ice cream is freezing, work on your cookies for your ice cream sandwiches. I have this electric ice cream sandwich maker that helps me make the cookies, but if you don’t have one, you can make any chocolate cookie recipe in your oven. My ice cream sandwich maker came with a handy tool that helps me to assemble the sandwiches. First I put down one of the cookies and then ice cream. I pushed the ice cream down so it would be more even and then I topped it with another cookie. NOTE: You don’t have to have this to make the sandwiches — I have included instructions at the end for making your ice cream sandwiches without a press. Each sandwich was immediately wrapped in plastic wrap and placed in the freezer. Keep in your freezer until ready to enjoy. If you want to dress these up a bit, you can roll the edges in sprinkles (which my kids enjoyed). 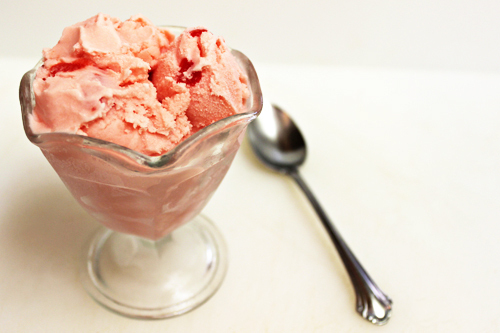 Of course, if you don’t want to make ice cream sandwiches, the Maraschino Cherry Ice Cream is great on its own too. 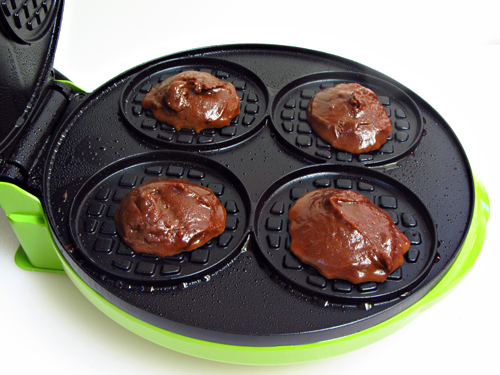 Mix brownie mix, oil, and eggs in a bowl, until combined (don’t over stir). Use 1 level tablespoon of batter for each cookie in the Ice Cream Sandwich Maker. Cook for approximately 1-2 minutes. Watch closely! To remove cookies from maker, use a fork and a spatula — lift gently with the fork and slide spatula under edge, gradually working spatula further under the cookie with the help of the fork. These look yummy! 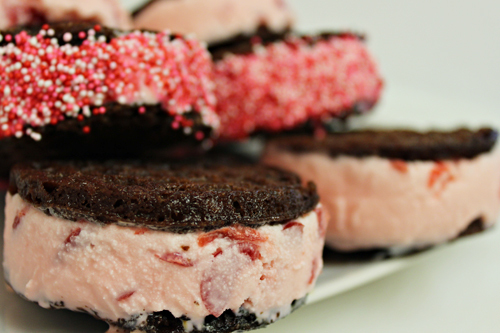 I haven’t made my own ice cream sandwiches (yet)… these look simple to make! Thanks Carolina! They are fairly simple and a total hit with the kids. 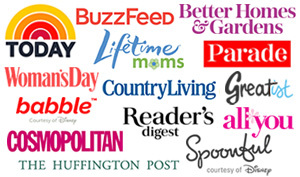 So many different ways you could make them too. These would be so fun to let the kids help with. Thank you for sharing such a great idea! What a fun summer treat! The sprinkles are a perfect touch-these look yummy! I love that cookie press, we love ice cream sandwiches so much, I might just have to buy one, your sandwiches look so yummy!!! Look at you, you got a “maker” for everything 🙂 It must be so much fun to play with all those toy! The ice cream sandwiches sound great!! Brandie this sounds AWESOME! 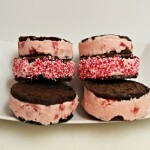 What a fun challenge and you really stepped up to the plate with a home run on this ice cream sandwich! Yum! What an interesting challenge – you did an awesome job. 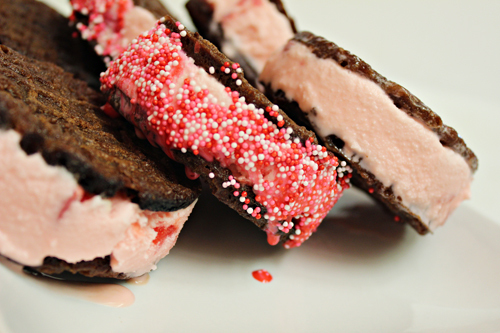 The ice cream sandwiches look really good.